(Lucena City, Quezon Province) The Suarezes known to be the QUEZON DYNASTY was ignored by the President in his visit to Lucena on Jan 22 at the Quezon Convention Center when he keynoted a provincial group gathering identified with the family. The Suarezes were never acknowledged by Duterte notwithstanding the hakot crowd of 5000 at ?3500 per head, according to a source. It appears the President was unimpressed. Duterte instead greeted one congressman named OCA on stage. The only Oca known in the province is Oscar Santos who was absent in the said event. Incidentally, Santos, on that date, was celebrating his 89th birthday. Santos is a known ally of the President when the latter promised to release the Coco Levy to Quezon farmers once elected when he barnstormed Catanauan in April 2016. All the seats provided on the stage were occupied by the Suarezes. His allies i.e. the Talagas, the Bongalings, the Prezas, the Wagans and the Bondoc Peninsula delegations, were all relegated below. The old man Suarez was on stage, his ailing wife, Aleta, his governor-son together with his party list congresswoman wife provided background to the President when he delivered his speech. 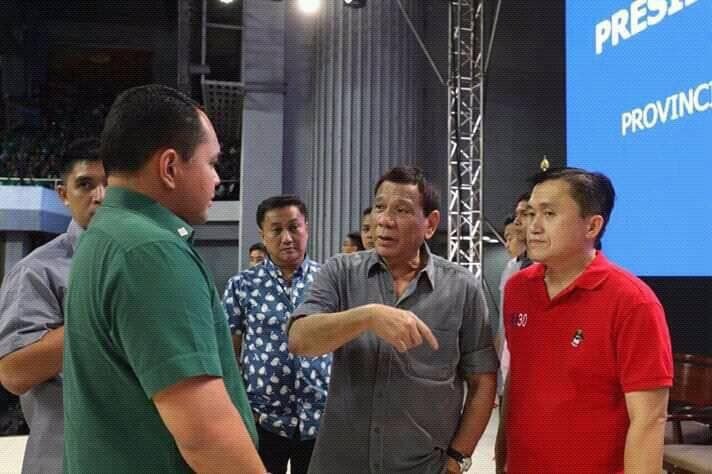 Another source revealed that the President was fuming mad when reports reached him that a Suarez organizer was asking for reimbursement for the cost incurred by the Suarezes for the event from former SAP Sec Bong Go and Political Adviser Francis Tolentino who spoke before the crowd before the arrival of the President. After his speech the President left in a huff. In that 2016 elections the old man Suarez campaigned hard for Jejomar Binay who poured hundreds of millions in Quezon thru the old man Suarez. In one Binay sortie in Candelaria the old man Suarez lambasted Duterte by haranguing the crowd “iboboto nyo ba ang isang mamatay tao (referring to Duterte)?” He never referred to Binay as magnanakaw when he faced several plunder cases before the Sandiganbayan. “Hindi na tumawag si Binay kay Suarez after the elections hanggang ngaun kasi ‘di pa napoproklama si Rody nasa Davao agad si Suarez…” added the Binay aide. Another reason why the President avoids Suarez is the latter’s unreasonable demands to Budget Sec Ben Diokno. “Ang sabi kargahan daw ang Quezon ng at least ?2B in infra project for 2019 dahil pamilya nya tatakbo. Minority Floor Leader naman daw sya at maiintindihan ng tao. Kung hindi, ibubulgar nya together with Cong Andaya ang insertion nya sa Balae nya sa Sorsogon. ‘Di pumayag si Diokno kaya inararo ni Suarez. Doon uminit ulo ni Presidente..” the source added. The governor-son on the other hand by a modus vivendi backed Mar Roxas in exchange of juicy goverment projects provided by DA Sec Procy Alcala. Ironically, the young Suarez is pitted against Alcala in the congressional contest in the 2nd District of Quezon. The young Suarez is banking on an Ombudsman perpetual disqualification edict against the former agriculture secretary which was providentially reversed by the Court of Appeals right after the filing of certificates of candidacy. The Suarezes locked horns with the Alcalas toe to toe the former relying on the President’s pronouncements on the involvement of one Alcala sibling to illegal drugs. Again, call it deus ex machina the infamous sibling linked to illicit drugs passed on recently thus removing the proverbial albatross around the Alcalas’ neck. One PNP top brass revealed that Suarez is trying to get the Akcalas included in the infamous Presidential Matrix. Linking the Alcalas in drug trade is a sure fire formula of political backlash just what Suarez did to Ex-Gov Raffy Nantes. With the aid of PDEA operatives mock raids were done in one Bordeos islet classified as drug laboratories. This was leaked to Inquirer’s correspondent Delfin Mallari and seconded to the Bishop of Lucena. Nantes was pilloried as drug manufacturer and not battery fabricator in the pulpit of St Ferdinand Cathedral days before the elections. Three days before the elections in May 2010 Nantes was all over the news. He had no time to rectify the fake accusation. Seven days after the elections Nantes was dead. The widow blamed practically everyone in Quezon politics. Again what is ironic is that the son of Raffy Nantes, trying to be pragmatic in the campaign fund department, allied himself and as running mate at that, to the old man Suarez. The young Suarez on the other hand, is a native of Unisan in the Bondoc Peninsula. When he ran for governor he used Unisan as residence. Observers say that in the 2nd district no carpetbagger has ever won in any elections noting that opportunist-strangers have no place in their district. The Alcalas count Tiaong-Dolores-San Antonio-Lucena as their bailiwicks (Katataspulong).